El Secreto is a unique barefoot luxury resort located in Ambergris Caye, Belize, surrounded by the turquoise blue waters of the Caribbean and lush tropical views. El Secreto offers newlyweds a romantic, week-long escape to paradise with a variety of activities for couples to enjoy together such as non motorized water sports like paddle surf, hobbie cat, kayaks as well as bicycles or with a simply relax at Ikal spa with the hotel’s signature hot sea shell massage. El Secreto nestles 13 exclusive individual thatched roof villas with a combination of contemporary and traditional elements. 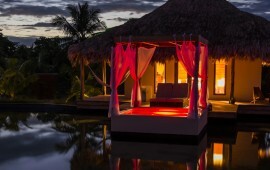 Fine Belizean tropical woods, marbled finished bathrooms with a tandem bathtub, outdoor private Jacuzzi and shower patio. All the villas are equipped with a king size bed, a state of the art led lighting system, air conditioning, ipod dock station, LCD TV, mini bar, safe, 400 thread Egyptian cotton Vivenda linens and Malin & Goetz amenities. El Secreto Restaurant offers a variety of international cuisine with a Belizean touch. Let the hotel staff pamper you in this true and authentic paradise to create lasting memories for a lifetime.